Geoff Siegert has been involved with Elders and the Financial Services Industry for 17 years. 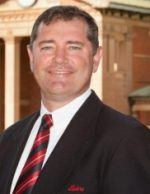 He commenced working in the General Insurance industry in 1998 and has since attained his Diploma of Financial Services Insurance Broking and Diploma of Financial Services Financial Planning. For the past 8 years, Geoff has operated a very successful and innovative Insurance business in partnership with Elders. He currently has offices in Bathurst, Orange and Lithgow. As an Authorised Representative, Geoff believes in helping his clients build a comprehensive program they need to make the most of their earning potential during their working years, as well as helping them with their retirement planning, superannuation, managed investments and estate planning needs. He achieves this by striving to provide quality advice, personalised service, practical ideas and superior risk protection solutions to all clients, ensuring a friendly and personalised relationship.